Last week at my weigh in I lost another 2.6 pounds. That’s 5.6 pounds in 2 weeks! Finally things seem to be looking up for me: I’m sleeping… with the aid of pharmaceuticals but at this point I don’t care, I’m losing weight, and I’m as happy as I’ve been in about a year! Seriously, I have been feeling so happy and blessed lately that it is shocking. It took a long ways to get to this point right now, and now that I’ve arrived, I feel like I can tackle the last 22 pounds of my “baby weight” and get back to goal. Even though I’m not back at goal weight yet, I have to tell you about a huge moment that happened for me over the weekend. My mom and sister were visiting, and my whole family went to the arboretum for a day, we walked around some of the gardens, had a picnic, checked out the learning center, and did a hedge maze! “L” loved it! I got to thinking that some of the things I did there I would have never done 100 pounds ago. I would have never walked around like that, and most of all I would have sat in a chair while my husband did “stuff” with my son, either because I was tired, or just too plain embarrassed to “actively” be his mom. We planted beet seeds in 4 different soils, explored worms, and had a dirt rolling contest! Then he did a scavenger hunt, and had to come back and bring me along so that I could see the cool plant that curled up when you touched it. And then… the maze. 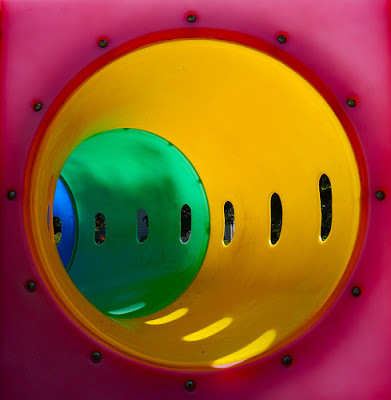 You walk into the first turn in the maze and are promptly greeted by a play tube – you know, like the ones you find connecting things in playgrounds. The ones that are made for small to medium children to climb through. The ones that I've had recurring nightmares about being stuck in and envisioning the headline "Fat Woman from Eagan, Stuck in Tube, Jaws of Life Needed." I knew I had to follow my son into the maze, and so I held my breath for a minute and climbed on in. My hands hit the sun-drenched spot at the end, and I felt them burn from the heat. A moment more and I climbed out the other side, just in time to be told from my obviously smarter sister that you can actually walk around the tube (she did only figure this out, after she too climbed through the tube). It is in these moments that I realize how far I've come in the past few years. How different my life is at 100 pounds less than it used to be. Stolen moments, where I smile quietly and enjoy a benefit of weight loss that has nothing to do with the actual number on the scale. As of yesterday I'm exactly halfway back to my goal weight, from my post-pregnancy weight. There is nothing about this journey back after Lily that has been easy, but there is so much about losing weight that is worth it. What non-scale victories have you had along your weight loss journey?